My almost two year old foster daughter sat in her high chair, grasping her hands together tightly at her chest while shrieking at me to hurry up and say grace over our lunch. Her older brother, however, had his arms crossed and a scowl on his face. “What should we thank Jesus for today?” I asked him. “Oh, surely we can find something to say thank you for,” I conjoled. Normally, this boy loves to pray, typically ending his prayers with an “Amen” full of gusto. But today, he was not at all happy about saying a prayer. “I not say fank you.” He glared at his plate, refusing to look me in the eyes. We are entering the season of Thanksgiving. Oh, how I love this time of year! Thanksgiving is one of my favorite holidays to celebrate. After all, what’s there not to love about Thanksgiving Day? Family. Friends. Food. Football. And how could I forget the beautiful fall leaves. It takes forever for the leaves to turn down here in Cajun Country, but usually by Thanksgiving week the colorful display has started in earnest. My heart just swells up to see God’s artistic glory on parade for everyone to see. Of course, the heart of Thanksgiving is to set aside time to express gratitude for our many blessings. I love the pause in the rush of life, calling me to remember and reflect and recount all the ways God has been gracious to me. I’m used to feeling thankful during the season of Thanksgiving. It just seems natural to put on my grateful heart and cherish my blessings, both big and small. But how often during the rest of the year am I more like my foster son? Belligerent. Hard-hearted. Cross with my situation in the world. As much as I hate to admit this, thankfulness is not my typical mode of operation. In fact, I am more likely to complain about my life than I am to express gratitude. Take my laundry room, for instance. I grumble and complain constantly about how quickly we run out of clean towels. I’m forever harping on my teens and tweens about folding clothes incorrectly or not putting their underwear away properly. Sunday mornings aren’t happy because I’m feeling angry that in spite of washing 25 loads of clothes over the past week, no one has “anything” to wear to church. Is my attitude one of gratitude? I think not. 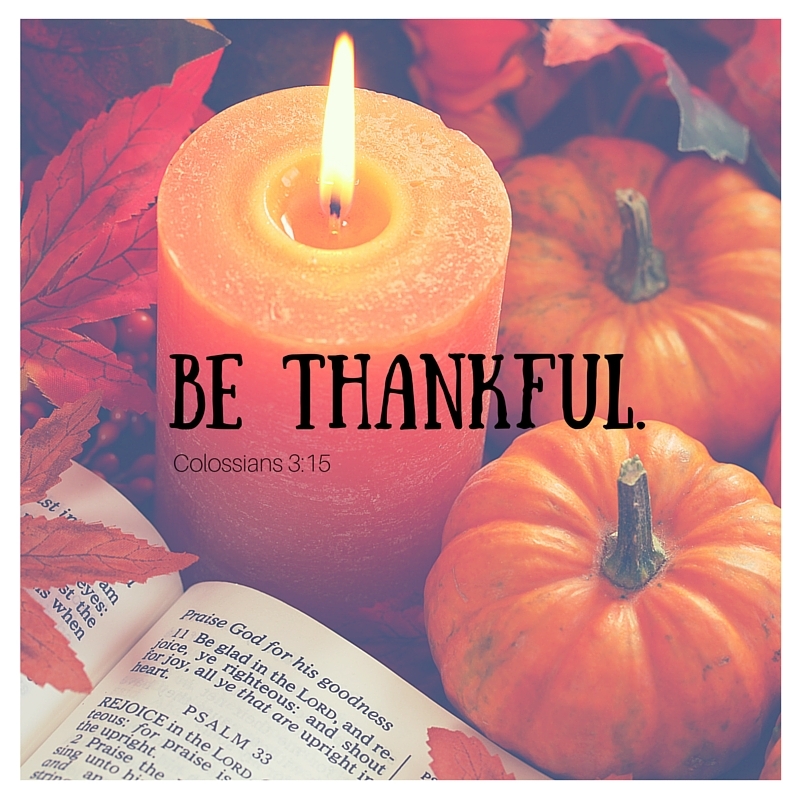 How would my day-to-day life be different if I chose to be thankful instead? I could start by being grateful that my family can afford to take daily showers and thereby create lots of dirty towels. I wonder if I could teach my children how to have grateful hearts by choosing to praise their helpful attitudes, even if they just wad up the dishtowels rather than taking the time to fold them. And perhaps I can choose to consider myself blessed because I get to wash more laundry than most people I know. After all, it means I have lots people to love, and my house is not empty. A few days ago, I started thinking about preparing my heart for the upcoming Thanksgiving season. As I pondered various ideas, I realized that my biggest desire is to not lose that grateful spirit during the rest of the year. I want to learn to infuse my heart with gratitude, and to approach living each day from a position of a thankfulness. That’s why I’m personally going to spend the next 30 days studying Scriptures specifically about having a thankful heart. I’m going to blog daily Scriptures, stories and sentiments. I hope you’ll join me and together we can learn more about consistently saying thanks to God. Great idea! Your kids sound so cute! God’s Blessings! They are little sweeties! We will certainly miss them when they go back to their momma in a few weeks. Love this!! Its awesome to be thankful for the gifts and treasures we have been blessed with.. Even “unfankful”kids!! heeeheee….. Love this story!